As you can probably guess, Digger won the Hugo Award for Best Graphic Story. 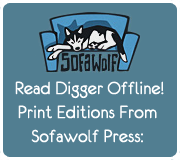 I cannot thank everybody enough–all my readers and fans and friends–for voting for Digger in the Hugo awards. Thank you all. It’s been an honor to throw drawing of wombats at you for all these years. I did not have the slightest notion, when I doodled the first set of wombat drawings, that it would go so far or so strangely or introduce me to such wonderful people as y’all. Thank you.